The Vapor Power Superheater is a coil tube design, similar to our steam generators. Saturated steam enters at the inlet of the superheater, passes through a set of coils, and hot combustion gases envelop the entire tube surface to achieve very high heat transfer rates. Superheated steam leaves the superheater at the steam outlet manifold. The fuel and combustion air is controlled by a linkageless fuel air ratio control that responds to steam temperature. The Vapor Power electric superheaters are custom designed to provide high efficiency, fast response heating. All of our electric superheaters utilize rugged electric resistance heating elements mounted in an ASME pressure vessel. 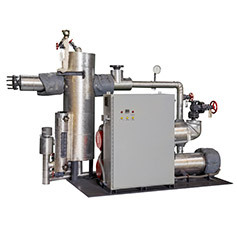 SCR temperature control provides full modulation to maintain the desired steam temperature. Similar to our fuel fired superheaters, the electric superheaters are available in a wide variety of pressure and temperature combinations. An electric superheater can be located adjacent to the saturated steam source or remote in the system if only a portion of the steam load requires superheat. The Vapor Power Superheater is available with the latest in communications and controls technology. Linkageless burner controls are a standard feature and a variety of PLC and HMI solutions are available. Our in-house programming provides customized solutions for every application. Remote data acquisition and control is available via ModBus, Ethernet, Bacnet, or other communication protocol.